I'm looking forward to our first "empty nest" adventure in Park City, Utah. While there, my husband and I are going to do a little kayaking down the Provo River. In anticipation of out trip, I purchased a DiCAPac WP570 Underwater Waterproof Case for my camera so I could snap a few shots as we paddle without having to worry about my camera getting wet. I was excited because the case came with an adjustable neck strap, an accessory that is always nice to have when traveling. Although the strap is functional, it wasn't very pretty. So, I found some cute ribbon in my favorite colors and crafted my own strap. Use a scissors to remove the old strap from the slide and buckles. Measure the width of the slide and buckles. Mine were 3/8-inch wide. I found a cute 4-foot spool of 3/8-inch wide ribbon, on clearance for $0.50. What a bargain! This was perfect because the ends are finished so I don't need to worry about fraying. Thread one end of the ribbon through the slide and machine stitch it, wrong sides together, as close to the slide as possible. Thread the other end of the ribbon up through one of the buckles. Then thread it up through the slide and down the other side. Finally, thread the ribbon down through the other buckle and machine stitch it, wrong sides together, as close to the buckle as possible. 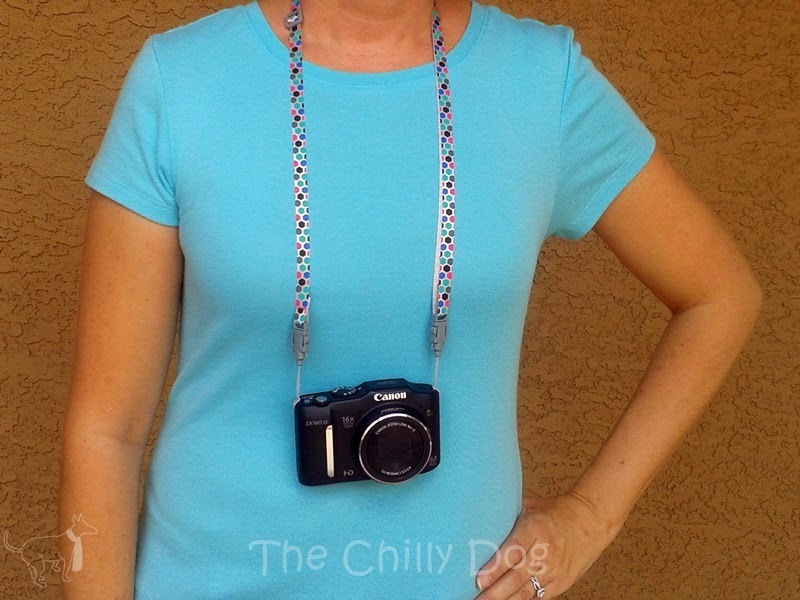 Attach the strap to your camera and you are ready to take pictures your travels! It's always nice to have an adjustable neck strap for your camera, especially when traveling, but more often than not they are functional, but not very cute.